'nspa' is a brand I haven't had much to do with in the past. I've had a couple of bath products as gifts but that's as far as I've gone. They're an affordable brand made specifically for Asda, which includes skincare and bath/body products. After my sample sized Clarins Melting Cleansing Gel ran out, I wanted to find an affordable alternative, as I really liked the whole melting-gel thing! 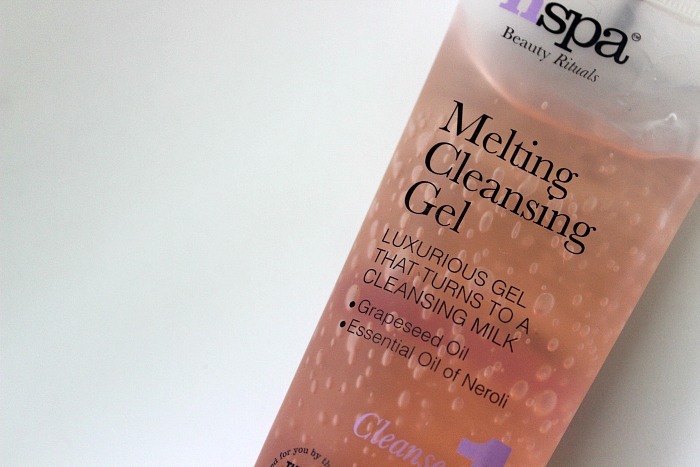 I just happened to notice the nspa Melting Cleansing Gel as I was shopping in Asda, and for £6 for 125ml of product I thought it was well worth a try. The product itself comes out a thick gel, which you work into dry skin to remove your makeup. Once you add water, the gel emulsifies into a cleansing milk, which nourishes the skin and helps remove those final traces of makeup. I don't get much of a scent from the gel, which I like, as over-scented face products make me slightly nervous. I'd say this product does a pretty good job at removing most makeup, but for waterproof mascara I like to go in with my eye-makeup remover beforehand. I remove the product with a warm flannel / muslin cloth, as I like to feel as though I'm really removing every last trace, whilst slightly exfoliating the skin at the same time. My skin feels soft and smooth after use, and I haven't experienced any drying or breakouts since using it. All in all it's a thumbs up from me and I'm happy knowing that it's an affordable alternative to the other expensive gel cleansers out there. Have you tried any skincare from nspa?